Citing previously classified official Government documents at an exhibition titled ‘We Built A Nation’ at the National Museum of Singapore, prominent socio-political website The Online Citizen (TOC) claimed that the separation of Singapore from Malaysia was not suddenly thrust onto Singapore as many believed. 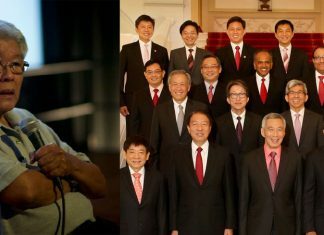 The socio-political website’s report suggested that the leaders of the Singapore were very aware much earlier that Separation was inevitable, and were very involved in negotiating the terms of separation. It also cast doubts on Singapore’s first Prime Minister, Mr Lee Kuan Yew’s tearing up during the announcement of the Separation. Former Nominated Member of Parliament and socio-political commentator Calvin Cheng has challenged the website’s assertions and calls TOC “naive” for propagating those ideas. Just because the ‘Albatross’ files showed that extensive negotiations took place during period of Separation, it does not mean that the leaders were not taken by surprise, the ex-NMP writes on his Facebook. “Even in a divorce, when one party is unwilling, that party tries to negotiate for the best deal before the divorce. We were asked to leave – but our leaders had to negotiate for the best terms possible, including the Water Agreements that still provide us water cheaply till this day 50 years on,” Mr Cheng said. Mr Cheng also took issue with TOC’s suggestion that Me Lee’s tears at the announcement of the Separation was fake. Just because others who were close to Mr Lee during the period of Separation claimed that he was pleased about the parting, and just because there is some evidence that our first PM may have actually supported leaving Malaysia, does not necessarily mean that his tears were fake, Mr Cheng remarked. “Human beings are complex. During times of grief, there can be relief. And even during times of relief, there can be worry and regret. After years of fighting with the Ultras, I am sure LKY must also have been relieved at finally separating. “But being a Malayan at heart, he must also have been upset. Any human being who has gone through separation must know that it’s always a mixed-bag of emotions”, he added. Mr Bilahari Kausikan, Singapore’s Ambassador-at-large, commenting on Mr Cheng’s post said, “of course the Separation was negotiated. That has always been known. Mr Kausikan acknowledged that history is constantly being revised, but claimed that TOC was trying to de-legitimise the accepted historical narrative and thereby de-legitimise the Government. He chided TOC as being anti-establishment attention-seekers for intellectually dishonest revisions of history, which do not bear any relation to the facts and historical context.